If you’re engaged, moving in together, planning to buy a house, or are newly married, you may have started to think about merging finances with your partner. This can make it easier to see a complete picture of your finances, and streamline bill payments, to name a few benefits. It can be an exciting step as a couple too, and promote greater transparency and openness between the two of you. 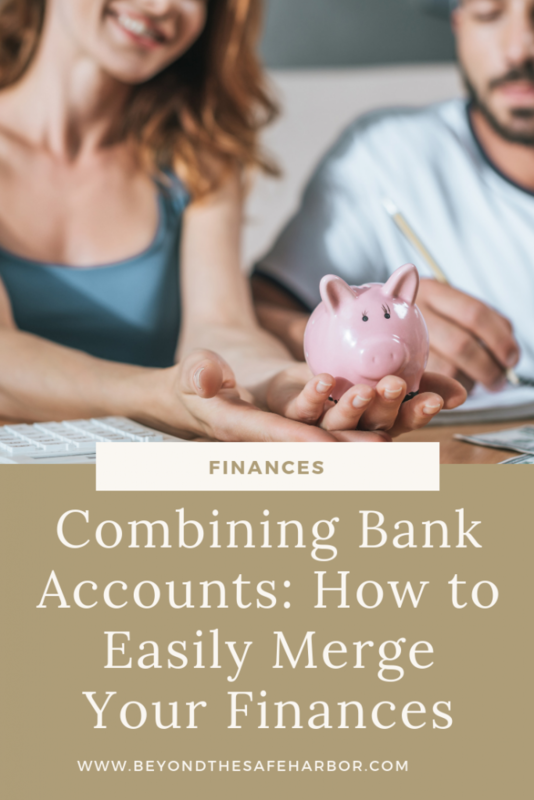 If you’ve deciding to go down this road, you may be considering combining bank accounts, whether that be merging your funds entirely, or simply giving each other access to at least one account. Doing so can feel pretty daunting. Where do you even start? And what options do you have? My husband and I recently went through this process ourselves, and it went pretty smoothly. So for today’s post, I’ll be sharing my step-by-step approach for combining bank accounts. #1. Make a list of all of your accounts. Make a list of the accounts you have, the financial institution or bank where they are held, and their current balance. This will give you full visibility of what you have as you begin to make decisions. You may also want to encourage your partner to do the same, so that you can see everything together. #2. Discuss your objectives and goals. This step is key. Sit down with your partner and discuss your objectives. Why do you want joint visibility and/or access to one another’s finances? Is it about making bill payments easier? Or for greater transparency? Is it to help in saving for a specific goal like a wedding or down payment? Get clear on why you’re considering merging some funds or accounts and what you hope to get out of it. This will ensure you’re setting things up in a way that makes sense. #3. Decide how to set it up. The most extreme, this involves merging your funds within specific categories. For example, sharing one chequing account which has your funds pooled. You would then have your paycheques all funnelling into the same account, and you would both have access to spending from that account. Bill payments could easily come out of this account, and the money feels like it’s shared 50/50. If your objectives are around a specific goal like saving for a wedding or a down payment, maybe you set up a new savings account that you both have access to, and both contribute to. This keeps things more focused, and prevents you from having greater access and visibility than you may want or need. Another example is having a joint credit card or bank account that you use for things like household expenses. This can make it easier paying for things you’ll both use. Alternatively, a hybrid approach might make more sense. This could involve having separate accounts but giving one another access to them so that you have full visibility. Or having some accounts you both contribute to, while still receiving your paycheques in separate chequing accounts. With today’s banking environment, you have a ton of options. I’d recommend checking in with your objectives from Step #2 in deciding what makes the most sense for you and your partner. Now that you’ve decided how you’d like things set up, it’s time to decide where to combine your finances, or where to set up that joint account or credit card. I’d recommend you and your partner sharing where you bank and any pros and cons. For example, if one of you loves your bank and is really happy there, that may drive your decision. You may also be influenced by bank locations and hours as well as any other convenience features. These things will all impact how easily you can bank there on an ongoing basis. Depending on what product you’re looking for, a certain financial institution may be a better fit. If you’re looking for a joint credit card, maybe there’s a current bonus offer on a great card at a specific bank. Or if you want to set up multiple accounts on one monthly plan, maybe there’s a bank that offers that at a lower fee. When it comes to things like merging finances, combining bank accounts, and setting up new products, it’s a good idea to book a meeting with someone at the bank in question. This will ensure you have enough time to cover things, without feeling rushed. You can often set this up online, making it really convenient! Find a time that works for both you and your partner. In preparation for the appointment, bring your account list from Step #1, including any account numbers or other helpful information the bank needs. Before this meeting, you should also be clear as a couple on how you’d like to set things up. #6. Wrap up any housekeeping items. I’d recommend making a list of everything you need to do and then whittling through a few things each day to make it more manageable. Making a big financial change is no small feat! I hope those tips help in combining finances with your painter! Have any questions? Leave them in the Comments below!